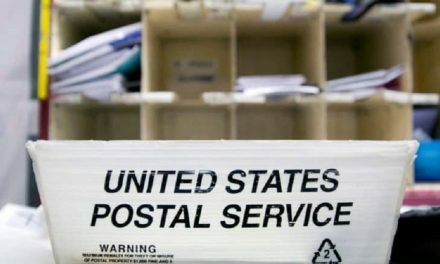 US postal workers’ unions have written a joint letter to Congress, expressing their concerns that Trade Promotion Authority (TPA) legislation currently working through the political system could have “disastrous” consequences for their members and the U.S. Postal Service. TPA – also known as ‘fast track’ – enables the US President to negotiate international agreements which Congress can either approve or disapprove, but not amend or filibuster. One of the international agreements which has raised the postal workers’ unions’ ire (and which they believe President Barrack Obama will try to push through by means of the fast track system) is the Trade in Service Agreement (TiSA). The American Postal Workers Union (APWU) claims that TiSA is a “trade deal the U.S. is negotiating behind closed doors with 50 other countries” which will “threaten the future of public- and private-sector services, including the U.S. Postal Service”. Yesterday (10 June), the presidents of the APWU, the National Postal Mail Handlers Union (NPMHU) and the National Association of Letter Carriers (NALC) signed a joint letter in which they urged Congress “to end the undemocratic practice of voting on Trade Promotion Authority before the trade and investment agreements negotiated in secret by our government and its trading partners are made public” because “such authority guarantees enactment of these agreements before their flaws can be democratically debated and amended”. The letter continued: “There is a long history of failure associated with these so-called ‘free trade’ agreements and we have outlined specific concerns about both the TPP [Trans-Pacific Partnership] and the T-TIP [Transatlantic Trade and Investment Partnership] agreements. “The former may prohibit the expansion of postal financial services and the latter could attack America’s system of affordable universal mail service – if the agreements were to embrace the expressed priorities of the Wall Street banks and the European Union on these public policy matters. “Recently we have learned that the Trade in Services Agreement (TiSA) now being negotiated in the World Trade Organization (WTO) includes an alarming Annex on Competitive Delivery Services. The annex was published by WikiLeaks on June 3, 2015. It would open the pricing of USPS Priority Mail and the legally authorized procedures of the Postal Regulatory Commission to challenges by foreign governments and foreign companies. Our postal system could even be attacked through the undemocratic Investor State Dispute Settlement process. “Worse, if the Obama administration or a future administration conceded to the wishes of the European Union, the TiSA could threaten the provision of affordable package delivery to rural and low-income urban areas by restricting our government’s ability to include parcels in the definition of the Postal Service’s universal service obligation. “Enacting the ‘Fast Track’ bill would prevent us from fixing these potentially disastrous flaws. For this reason alone, you should reject the TPA legislation. In a move that many outside the US will find confusing, the Democratic President Obama will mainly be relying on support from Republican leaders in the US Congress in his bid to push through the fast track legislation and there will probably be a vote on the issue tomorrow (Friday). The TTIP has also provoked strong reactions in Europe, where – as in the US – it has cut across the usual political divides. The anti-TTIP lobby has produced an uneasy political marriage of unions and environmentalists on the left and anti-federalists on the right. 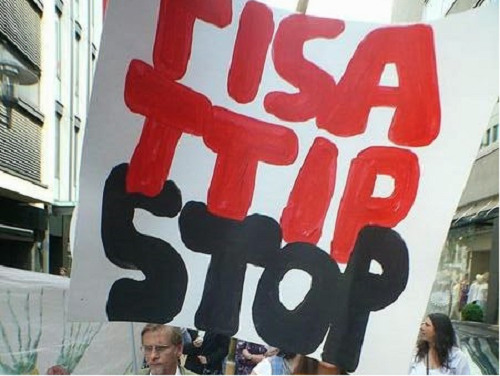 In the European Parliament yesterday, more than 40 MEPs opposed to TTIP stamped, booed and clapped to show their disapproval after a debate and vote on the subject was suspended.